For a while now I have been interested in the different shades of wood. Especially the old huts in the alpine regions made of larch, which have been transformed by the weather and the sun. At first they look a really burned, dark brown, after a while become grey, and later even silver depending on the direction they are facing, the climate they’ve been exposed to and the type of timber. The timber of these facades tell a story of place, time, how that timber been used, the knowledge of the people who processed it and, as a result, the circumstances of what happened around the buildings they comprise. 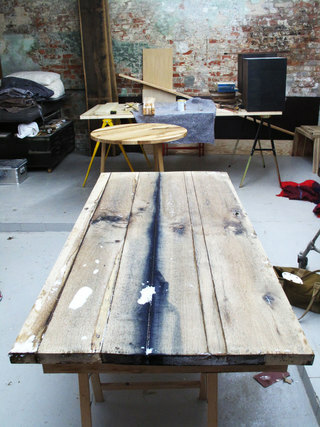 One day I was processing a big plank of Oak, planing it at the workshop of a friend who has a decent sized thicknesser. There was some crazy colouring in the Oak and I was really fascinated, although after showing it to my friend he became quite worried: there must be some metal in this piece of wood that’s responsible for the discolouring. While I was more enthusiastic, he was rather worried about any possible damage to the machine’s costly blades… Thankfully, the metal was very much within the timber and we hadn’t damaged anything. After some research I found out that this was most probably a piece of shrapnel from the Second World War embedded within my piece of Oak. It had been sitting in the tree for such a long time that the tree had continued to grow around it. That got me thinking about whether it would be possible to achieve this colouring in another way and so I decided to experiment. 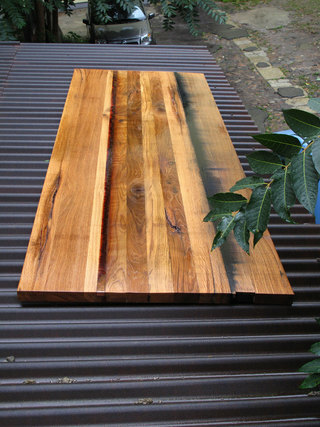 I ordered pieces of strip metal made of iron, copper and brass and inserted them into a plank of Oak that I had made beforehand. I knew there would be a chemical reaction between the tannic acid of the oak and the iron bar as soon as water was involved, although I didn’t know whether to expect anything of the copper or brass. 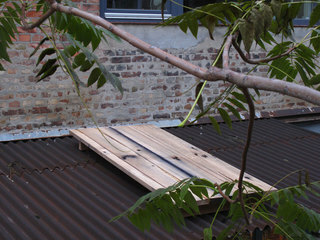 Despite the piece weighing over 120kg, we managed to get it onto the roof of the studio. Then all we had to do was wait and the weather would do its job. And it did! The process was timed to be in autumn and winter, and every week or so I climbed up to have a look. After the first rain I could already see a reaction - the wood around the iron bar started to get a dark grey tint, the iron washed out into the Oak. A very exciting experiment was showing first results. 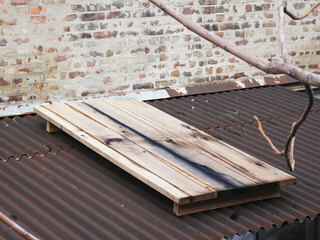 Homegrown weathered timber! The colour was particularly amazing after the rain: the Oak was of an intense orange/brown and the washed out iron left a blue/greyish black stain in the Oak. As the roof is at an angle I could see gravity’s effect on the reaction too: at the top it was a slight touch of grey, and at the bottom of the iron where it had washed out further into the wood, the discolouring was more intense. After about 4 months I decided to stop the process. 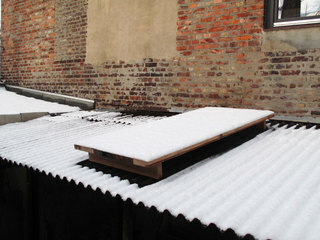 It was winter, snow covered my Oak plank and it was frozen solid when we took it off the roof. It was like an ice block inside the studio, giving off cold whilst defrosting. The drying process was exciting to watch. Once dry, the oak itself had become more pale with the dark stained tints from the iron. The copper and brass had stayed more or less the same, not reacting with the timber. I was pleased; an experiment with this kind of outcome is very, very satisfying!